The Hairpin Museum acquired this old hairpin on 2011.4.3. 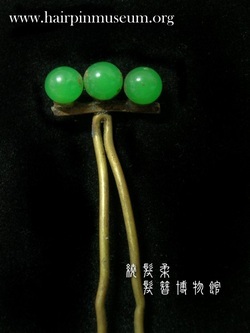 This is a Taiwanese hairpin from about the 1940s. At that time, Taiwan was still a Japanese colony, so this hairpin is full of Japanese style. The pin is a simple style made from brass wire. The Hairpin Museum acquired a new object on 2011.3.7.It is about 2.5 cm wide and 19.2 in length. This is a modern plastic hairpin with some acrylic painting on it. Click the link to see more examples of modern hairpins. The Hairpin Museum acquired a new object on 2011.2.20. 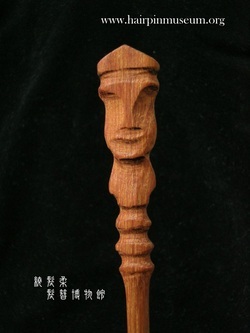 This is a hand carved Taiwan aboriginal hairpin. It was made by an artist of the Rukai Tribe (魯凱族). The head is a symbol of the leader of their tribe. It was made from wood of the Calocedrus formosana or incense-cedar (台灣肖楠木). It has a very nice smell. The face on this hairpin is faintly similar to the carved stone statues (Moai) on Easter Island. Recent research on languages and genetics suggests that one of Taiwan's aboriginal tribes, the Yami may be related to the Polynesians who setted Easter Island and other islands in the Pacific. Click this link to see more examples of carved wooden hairpins. The Hairpin Museum acquired a new object on 2011.2.12. This is a symmetrical hairpin from a grave. It is about 5.8 cm long and 2.9 g in weight. It is copper-alloy (possibly bronze) with a thin layer of gold (gilding) on top. The gold surface is now hidden by a layer of copper corrosion. The Hairpin Museum acquired this old postcard on 2011.4.13. This very elegant lady wears a silver pendant and some real flowers on her necklace. In this postcard you can see that she wears all kinds of jewellery - necklaces, earrings, finger rings and bracelets. The Hairpin Museum acquired this old postcard on 2011.3.16. This is a used postcard with a French message written on the back. 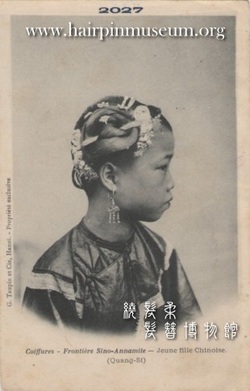 We can see the young girl's hairstyle on this postcard and also see howshe uses several hairpins to decorate and secure her hairstyle. Fortunately, there are similar hairpins in our museum collections. This postcard provides great help for us to understand how women wore hairpins in the past. Click the link to see more examples of women's hairstyles on postcards. The Hairpin Museum acquired an old postcard on 2011.2.21. 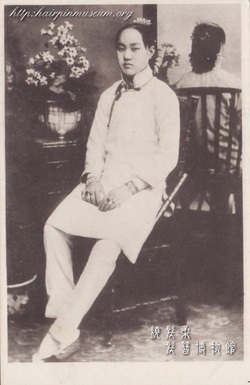 This Ching Dynasty lady sit in front of a mirror to show both her face and her hairstyle. She has bound feet. She wears real flowers on her head as hair ornaments. 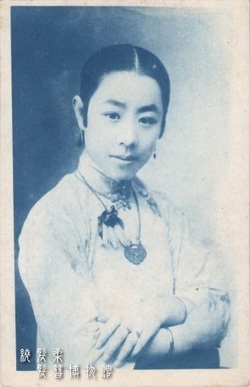 A traditional way to take a studio portrait of a woman was to place a mirror behind the subject so that the face and hair ornaments can be seen in the same picture. We can see some more examples of this fashion in the picture gallery.